Alright, it’s been three weeks, so you know what’s coming. Here is the Prologue of Dust 3, and the rest of the volume will be going up over the month of November, so stay tuned. Chapter 1: A Trade with that Tranquility Girl! Chapter 2: An Exploration in that Capital! Chapter 3: An Adventure for those Bodyguards! Chapter 4: A Dreamy Night for that Princess! I can’t believe it, the third volume is actually here. This volume has Dust getting involved with the first princess of Belzerg, Iris. Dust and Iris previously interacted in the spinoff (Continued: Gifting this Wonderful World with Explosions!) written by Akatsuki-sensei, so I’ve always wanted to write about them. And now I finally have the chance! 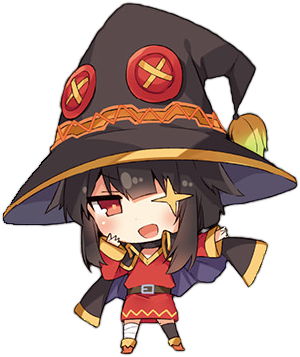 She is one of the more popular characters in Konosuba, so I’ve agonized greatly over how to handle her, but I think I’ve managed to adequately convey her charm across in my writings… It’ll be fine, right? I hope you look forward to seeing her in action. This book also touches a little on Dust’s past, so I hope you look forward to seeing that as well. I wonder if this would change the image of Dust that everyone has in their minds? Apart from Iris, her bodyguards/educators, Claire and Rain, also have a time in the spotlight. The two of them are often toyed around with by Kazuma in the main series, but in this spinoff, for certain reasons, they end up going on an adventure together with Dust and get up to all kinds of hijinks. Additionally, one of the minor characters who made an appearance in the main series will be making an appearance as well. Those who start by reading the afterword first might have some fun trying to guess who it could be. I feel that the most important thing about this series is to give those characters that aren’t part of Kazuma and the main party a chance to shine. Every volume should feature a side character. I hope to maintain this rule in my works. As for Dust, I want to make him seem more scummy, yet I also want to show off his cool side… This balancing act is a hard one to pull off. I’ve mentioned this before, but this volume will touch more on Dust’s past that was hinted at in volume 1 and 2, so do look forward to it. Now then, this might be a little early, but allow me to talk a little about the next volume. It is still a work in progress, so I can’t provide any more concrete information, but please look forward to it. I’ll give it my all. On a different topic, the child of a friend of mine recently told me “Oji-san, you drew this? You are a really great artist!”. He ended up really disappointed when I told him that I’m not the one who drew it. Yuuki Hagure-sensei, thank you for the wonderful drawings that you always provide for each volume. Well, keeping with this flow,it’s time to offer words of thanks and appreciation to everyone who helped me. Natsume-sensei, thank you for giving me free reign this time too. I truly realized how loveable of a little sister character that Iris is while I was writing this volume, and I had a lot of fun bringing her to life. I hope for your continued support in the future! Mishima Kurone-sensei. I had the chance to properly examine Iris’s, Claire’s, and Rain’s illustrations this time, and Rain looks really amazing… Thank you for providing me with the reference material! My thanks to all the editors at Sneaker Bunko, Mr M in charge, and everyone involved in the production of this book. Thank you very much. And of course, all of you readers who picked up this book. I’m satisfied as an author if my works bring even the slightest bit of joy to you. I hope to see you again in the next volume. A girl laughing as she twisted her body and a lady who approaches with heavy breaths. Both of them have blonde hair and blue eyes. It is obvious from a glance that they are nobility. I only just got to know them, but to be honest, I’m really not great with these types of people. Darkness is still fine considering her usual behaviour, but I really don’t want to get involved with royalty and nobility. Well, this time is an exception. Regardless of any principles I might have, there’s no way I can take my eyes off these two girls right now. The woman who’s trying to forcibly strip the clothes of the young girl, Claire, and the half naked young girl who resisted amidst giggles, Iris. I didn’t think I was into this kind of thing, but this sight isn’t too bad. Maybe I should get Loli Succubus to show me a similar dream in the future. This might seem like a crime from an outsider’s perspective, but it’s just two girls fooling around in the dressing room, so there are no problems from a legal standpoint. … Though I probably would’ve called the cops if I stumbled upon such a scene without any context. After letting go of the half dressed young lady, the older, more dangerous seeming lady began vigorously tossing away her clothes right in front of my eyes. There might be certain issues with Claire’s personality, but she has an amazing body. Her chest swelled far beyond what I expected as she removed her jacket and shirt. Paying no heed to my intense stare, she quickly took off her trousers, leaving her clad in only her underwear. I’ve only ever seen the white suited woman while she’s dressed like a man, but she sure is packing some amazing goods underneath. Iris stripped down to her underwear too while Claire’s sight was averted. Her skin is as unblemished and clear as porcelain. She’s a little too young right now, but she has a very promising future ahead of her. Looking at my still clothed form, the young girl pestered me to hurry up and take them off. Rather than being suspicious of my clothed state, it’s more like she’s concerned over being alone in the baths with the other girl. It’d be suspicious if I didn’t strip here. I carefully replied, making sure to use the appropriate language. Even while taking off my unfamiliar clothes, I never took my sight off the two girls struggling with each other for even an instant. Its time to see Iris again! I get the feeling Dust has taken over Rain’s body. Gosh I’m so excited! I gotta reread volume 1 and 2 now since I forgot what happened lol. Thanks for the translation! Isn’t there a bit of pink next to iris”s hand? ?